“…Ceilings afford great scope for decoration, yet it seems a strange defect in our modern method of decoration, that in many mansions the walls of the principal rooms are highly decorated with expensive papers, to be afterwards partly or wholly covered with pictures, looking-glasses, and bric-a-brac, and the floor is covered with carpets, to say nothing of furniture; but the ceiling spreads its broad blank waste of white above us, expressionless and inartistic to a great degree. The ceiling being the crowning glory of a room, and the part most seen, should be decorated with form and colour.” William Millar, London, circa 1890. That was 1890 and the Design Trend for 2018 Statement Ceilings – The Fifth Wall is in! I am particularly excited to see this Trend. Here is my favorite statement ceiling medallion. This may be all you need, or add the beautiful side ornament and pearls to create a frame for your statement ceiling. 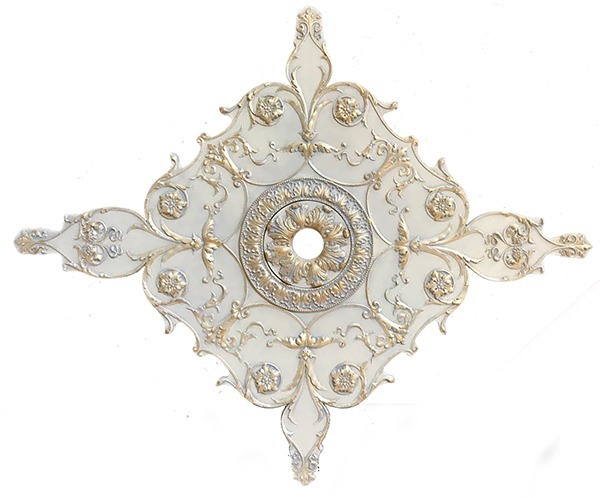 Empire Pearl Running Ornament $18 a ft. 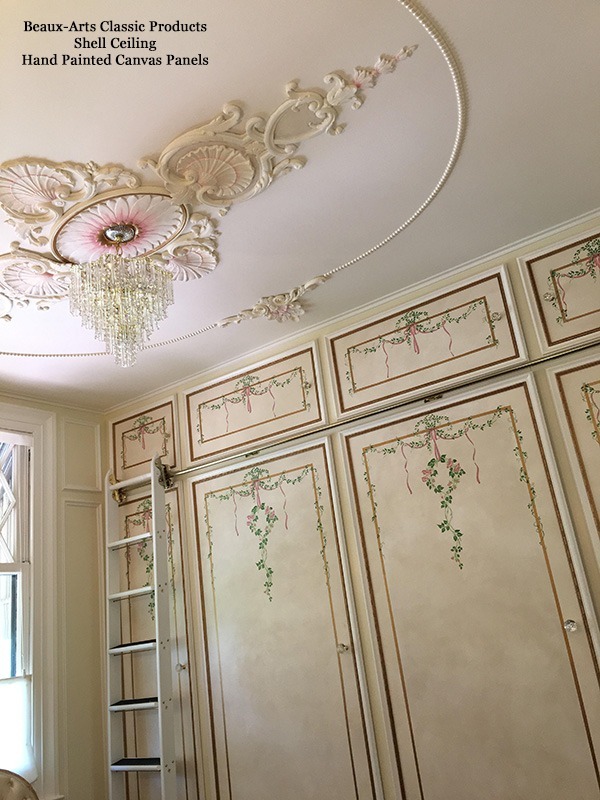 The Louis XV Hand painted Ceiling Medallion, Side and Corner Ornament works with most decor. Always elegant and timeless. Louis XV Running Ornament $17 per ft. This custom finish creates a beautiful Statement Ceiling. Very dramatic with the black background which would be splendid on a white or how about a black ceiling. Black ceilings make the ceiling disappear giving a feeling of volume to the room. The center can be cut out. We added a faceted crystal to further embellish the center. Premium Finish calls attention to the urn and flower carvings. Beaux-Arts Classic Products Statement Ceiling and Fifth Wall Florentine Style Ceiling cast in Resin. Resin Ornamentation is strong and easy to install. It ships easily as it is not delicate like traditional plaster ornamentation. This centerpiece was designed with the option of adding cabachons to a setting which is also an appropriate spot for installation screws. Florentine Corner Ornamentation in a Premium Finish. $250 Please notice the installation screws. These can be painted to blend with the ornamentation or this is a perfect location for a gemstone. Depending on your decor a Mother-of-Pearl cabachon would be very handsome. Florentine Running Moulding $22 per ft.
Florentine Corner Ornament used as a Center Feature for a wall panel on this door. Rose Quartz cabachons used to cover the installation screws. 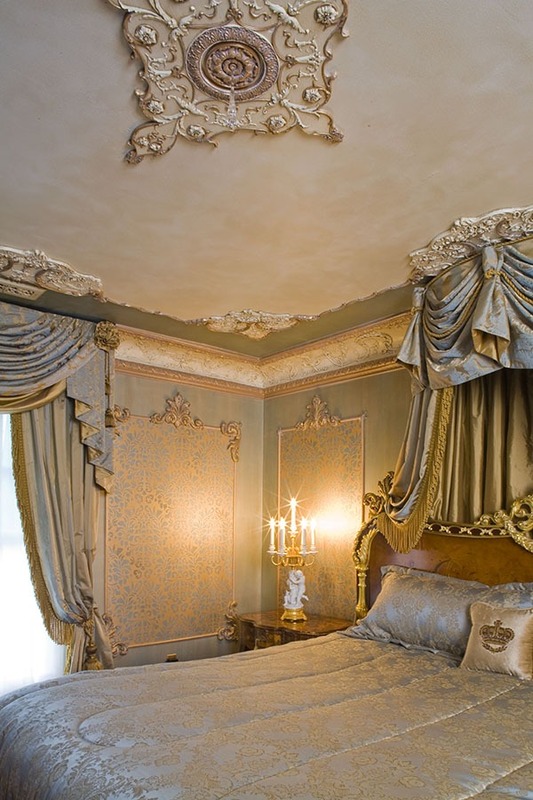 Check out all of our beautiful Statement Ceilings – The Fifth Wall on our website under Ceiling Ornamentation.